These Healthy Brownie Bites require just seven ingredients, are healthy enough for a snack and also make a great dessert recipe! Super quick and easy recipe to share with you today because it’s Monday…and who doesn’t need a little chocolate on a Monday? These Healthy Brownie Bites are actually just a twist on one of the most popular recipes on the blog – my Sweet Potato Banana Bites. If you’ve made that recipe before, you know it requires just four basic ingredients! This recipe adds just three more ingredients and voila! You’ve got dessert. These bite-sized treats are a healthy way to satisfy your sweet tooth and in my opinion, they’re still healthy enough for Squish to eat as the occasional snack! So that’s a win-win in my book. 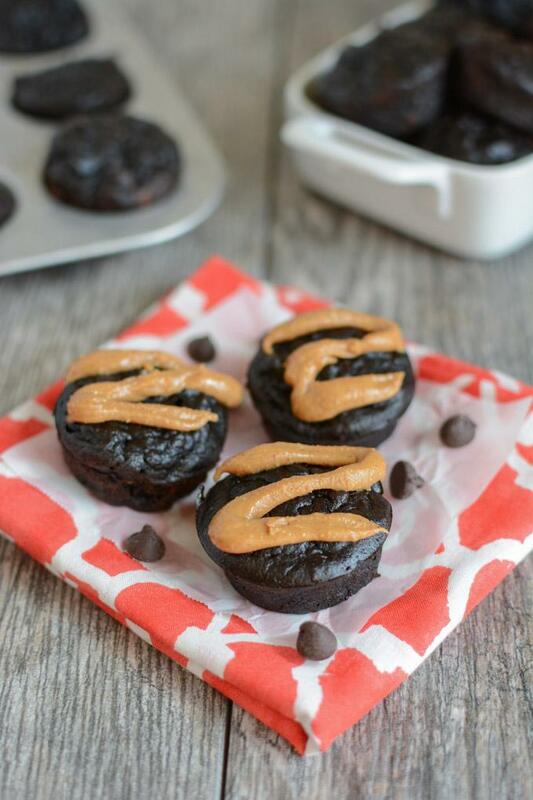 I enjoyed them topped with a little extra nut butter but it’s not necessary! Like I mention about the Sweet Potato Bites, these aren’t super sweet. If you’re looking for a dessert that’s a bit more indulgent, but still healthy, you might like these Gluten-Free Sweet Potato Brownies. These Healthy Brownie Bites require just six ingredients, are healthy enough for a snack and also make a great dessert recipe! Combine first 3 ingredients in a bowl and mix well. Mix in chocolate chips if desired. Bake at 375 degrees F for 16-18 minutes. So there you have it! I definitely add the chocolate chips to mine and just use 3 T maple syrup. You could also use honey instead of maple syrup. Yum! Healthier brownies? Sign me up! I’m all about brownies of any shape, flavor and size. And healthier? Makes ’em even better! Pinned! This looks so good. Simple but healthy! These look SO good….I just ran out of cocoa powder and now I have more of an impetus to go pick some up! Pinned! A great use for some of the sweet potatoes that I baked in advance yesterday. They sound yummy! How did you know I told my husband last night after dinner, “I just want something sweet, like a brownie bite that isn’t totally horrible for you”. BRILLIANT! My pregnancy-craving self THANKS YOU! Anything with chocolate and sweet potato I must try! Gorgeous and healthy treat!!! I will add the choc. chips too! So so excited for these! I’m obsessed with your sweet potato brownies ! Can’t wait to try these ! All your recipes sound so delish!! So your telling me I can pop a few in my mouth all in one sitting without feeling sluggish? Well alrighty then – challenge accepted :). We’re intrigued! Bring on healthy brownies! These look amazing! 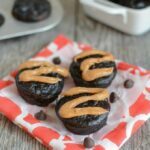 I’ve recently cut out the processed sugar from my diet, so I definitely have to keep this recipe in mind to satisfy my pb & chocolate cravings. Yum! I would like to try these but I don’t like the flavor of maple syrup or honey. Anything else I could use? Could they be made with no sweetener? These look like a fab snack for my little ones. I’m wondering about batch cooking them and what the best way to the store them would be? Also, can you freeze them? I stored mine in a tupperware covered but not with a sealed lid. I haven’t tried freezing them but let me know if you do! Hi Lindsay, do the sweet potatos need to be boiled first or mashed directly without boiling? yes they definitely need to be cooked first. I just poke a few holes in mine and put it in the microwave for about 5 minutes! Thanks so much for the quick reply. How long do they last in the tupperware? Has anyone tried making these with pumpkin instead of sweet potato? These sound really good. Do you think adding mint (like crushed peppermint candies) would be good? I’m not sure how noticeable the sweet potato is. i think that’d be great! the sweet potato isn’t noticeable…they mostly taste like chocolate. Really would like to eat heathier! Thank you for posting! I made the brownies and they were delicious a perfect snack in between meals. Hello, these sound great. How many are allowed per serving and is there calorie info? I’d say a serving is probably 3. I don’t have the calorie info. I love how nutrient dense, EASY, and simple these brownies look! plus they sound SUPER yummy! must try! Is there a substitute for the nut butters? I’m allergic to nuts. Can I use flax or chia eggs instead of regular ?? i haven’t tried it! i’m not sure this would be the best recipe for it but you could try!